The Hidden Messages in Water 1 | Sunmark Publishing,Inc. Read this book and see how the microscopic crystals of frozen water (ice) are actually teaching us how the universe works and how we humans should live. The long-awaited collection of latest writings by an internationally acclaimed author. Words were “shown” to water by posting pieces of paper with different words typed on them onto glass bottles filled with water. Though the words were in different languages, all words meaning “thank you” made the water respond with beautiful, regular-shaped crystals. Words intended to hurt others failed to make crystals in all cases. Water is a mirror that reflects our minds. Water is a medium onto which every bit of information in this world can be transferred. For example, if water is exposed to the words “thank you” and then frozen, it will settle into beautiful, regular-shaped crystals. 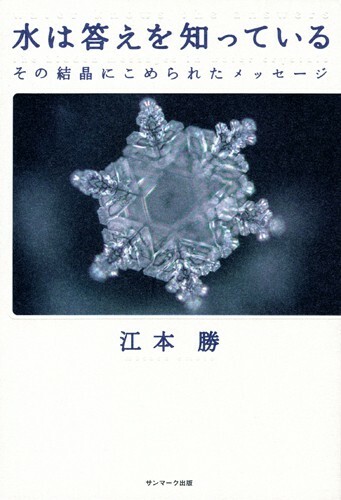 However, water that is shown the words “you fool” fail to form crystals in any regular shape. What does this mean? It means that the words “thank you” have the power to affect all things and change them into good. Copiously illustrated with striking photos of water crystals, this book speaks out to the reader. See for yourself what our world is comprised of, and how each of us really should live. Sweden Taiwan Hailand Turkey Ukraine U.S.
Born in Yokohama city in 1943. Graduated from the Department of Humanities and Sciences at Yokohama Municipal University. Established the IHM Corporation in 1986. After being introduced to the concept of micro cluster water and Magnetic Resonance Analysis technology in the United States, he has been engaged in water research from the perspective of an original thinker. Currently Director of the Board of IHM Corporation. Author of many works including MIZU KARA NO DENGON (The Message from Water).